No wonder most soccer fans in the United States were upset by this Nike design for their national team. 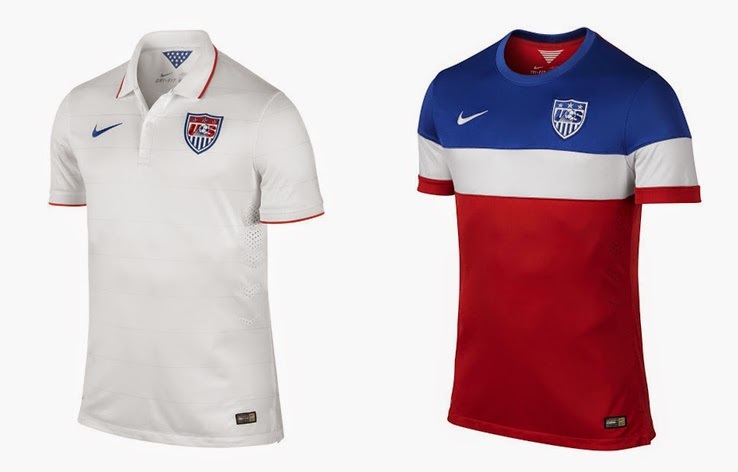 After numerous great looks in the past, this years' American kits are oh so boring. The home shirt is something I would imagine Andy Roddick wearing during a Davis Cup tennis match, the preppy polo look does not belong on the football pitch! The three color away shirt is just plain weird, it looks more like the flag of Yugoslavia than anything remotely close to resembling the stars and stripes. Nike did a pretty good job yet again for the Portuguese who are celebrating the 100th birthday of their national Football Federation. The home shirt's got nice detail with the horizontal red on red stripes, and the crest and Nike brand are positioned perfectly. 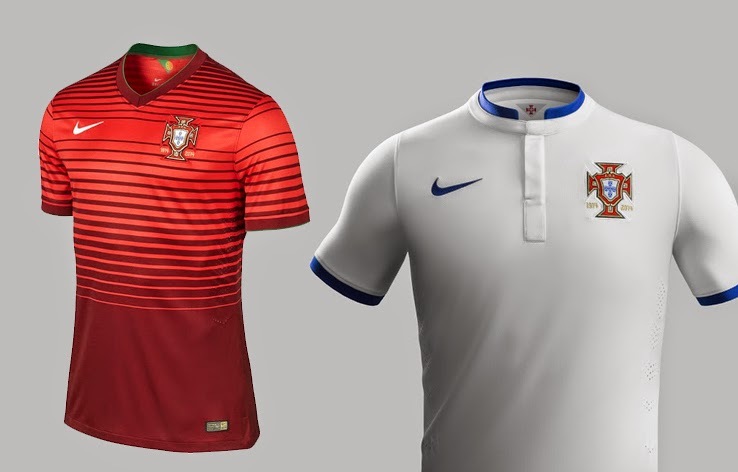 The away shirt is the real gem for the Portuguese, with the blue color paying tribute to Portugal's away kits from their first ever World Cup appearance in England 1966. Adidas has been Germany's national team kit manufacturer since the 1982 World Cup in Spain, and after going with a plain white design in the first two attempts (1982 & 1986) Adidas has since produced absolute masterpieces for the Germans to wear in almost every major tournament. 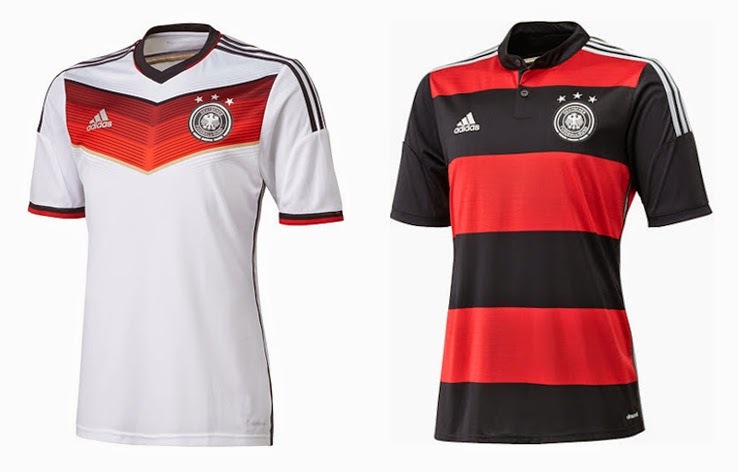 This year Adidas created a memorable look yet again; with the Germans bound to look sharp in both their home and away shirts. The home design is an instant classic, with the gradient chest detail being a great focal point on an otherwise classic white German shirt. The away is also an interesting move by the designers, again staying away from the alternate green color used by Germany for away kits until 2002, and again during the European championships two years ago. The alternate kit is bold with the contrast of the red and black hoops. 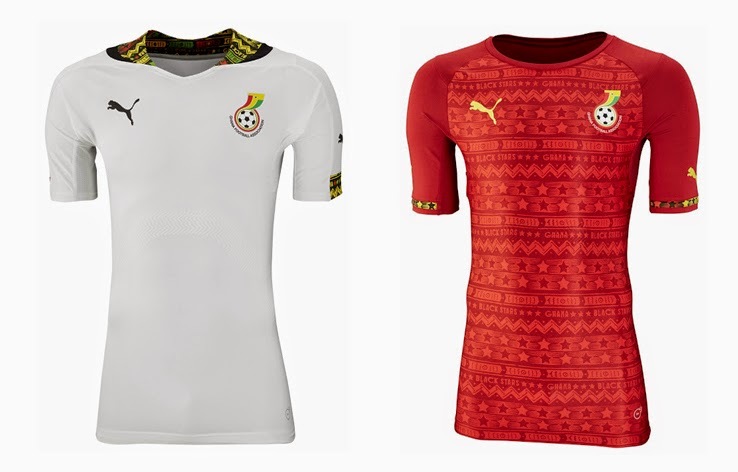 Puma's design for Ghana deserves full marks, as they took their creative freedom to create a masterpiece for the African nation. The busy colorful neck detail on the home shirt creates perfect balance with the otherwise very white shirt. And the away is very nicely designed as well, with the fire red shirt perfectly displaying the muted busy design on the front of the jersey. With both the US and Germany wearing white as their primary color, there's a good chance that we will get to see this awesome away kit in action this year.